I found a stick of butter I didn’t know I had hiding in the very back of the freezer, and as I held its frozen self in my hand I realized that everything was going to be ok. It wasn’t the end of the world after all – it was only Tuesday. I laughed a little to myself, then burst into tears and when I was done crying I couldn’t remember what I needed the butter for in the first place. Welcome to cooking with a woman entering her 30th hormonal week of pregnancy. I am growing and slowing and laughing and crying all at the same time. It is taking me longer to get up our stairs and I am completely winded when I finally reach the top. 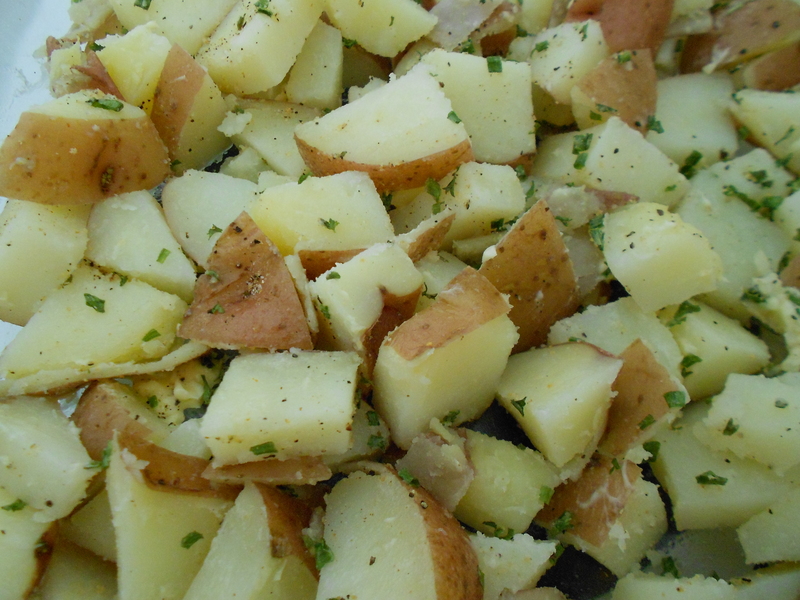 My appetite is enormous and while the rest of the world seems to be enjoying their spring greens, I am plotting how to inconspicuously add potatoes to the menu. Comfort food – that’s what I want. I imagine it must sound insane to those of you not in the throws of prenatal life, but I just want pasta for dinner. Pasta and sausage – preferably with a side of potatoes and bread and butter, please. I would drink heavy cream if I thought for one minute that I could get away with it and pour gravy on my oatmeal. Maybe it’s because I spent the first few months not being able to stomach anything but grapefruit slices and sour candy. Who knows! The problem to be solved is how to cook hearty, but healthy. How to mix Spring green with my cravings for Winter heaviness, in short – how to eat potatoes more often and yet not gain several hundred pounds in the process. I think I may have found at least one solution, one of my family’s favorite meals that we lovingly called “Poverty Dinner”. There really is nothing ‘poor’ about it other than being inexpensive and easy to make. It’s a tasty, filling sort of one dish meal that worked perfectly with the first greens that braved the uncertain glory of Spring. several good handfuls of washed greens; spinach, baby kale, swiss chard, etc. Potatoes and ground beef, comfort food at its finest, mixed with vitamin-packed greens fresh from the garden or market, making a simple meal that can be cooked up after a day in an office or in the field. I like to use my big cast iron skillet for this. Heat the frying pan over medium heat and then add the oil and the potatoes then cover. Let the potatoes cook for a little while before adding the garlic and onions so that they don’t get too overdone by the time the potatoes are tender. Once the potatoes are feeling a little giving, break up the ground beef into the pan and stir well. Keep an eye on it to make sure that the ground beef gets cooked thoroughly. Another way to do this, although it changes the ‘one-dish’ nature of the meal, is to let the potatoes cook all the way and then remove them to cook the beef. Either way, you may need to add a little bit of water to the pan to keep the beef moist while it’s frying. If you’ve kept everything together, return the cover and let the potatoes finish cooking. Otherwise, return everything to the pan and reheat. Now – here’s the super healthy part you’ve been so patiently waiting for. Once your potatoes, onions and beef are completely cooked, heap the greens on top. There will be a little bit of water clinging to them from washing which will help steam them. Cover and reduce the heat to low. In a few minutes the greens will have wilted and steamed and completed your meal. Season with salt and pepper as you desire and you’re ready to go! Because really, who has time to stand over a hot skillet and *fry* the silly things! Some days I miss living out on the prairie, with my man busting sod all day while I busy myself with bread baking and soap making and chicken feeding. It was a good life, but not exactly the one we enjoy today – and honestly, that’s alright. Our days have gotten so much easier with the invention of electricity and indoor plumbing – I particularly enjoy toilet paper and dishwashing liquid. And who can say that things were better *before* the advent of penicillin and Tylenol? I’m here to say that there are good things about this modern age, even if it is a bit hedged in by insane busyness, and one of those good things is my oven. The other night we had our weekly Breakfast for Dinner and I made oven homefries, a mash-up of sorts of oven fries and the hashbrowns you get at the local diner. One of the best kitchen tips I picked up while waitressing is to boil the potatoes before frying them, they cook faster and get crispier that way. Also – I never seasoned them enough. You’ve got to season homefries like you mean it – like you intend to Taste those herbs and spices when everything is said and done. First thing to do is chop your potatoes into bite-sized, homefry pieces. While you’re doing this, you should have your pot of water on the stove, heating to a boil. It’s up to you whether or not you want to peel your potatoes first, I like mine a little on the rustic side so I let them keep their skins. When the water is boiling like mad, add a little salt and then toss in your potato chunks (toss them carefully so as not to bathe thyself in boiling water). You don’t want to cook them all the way – this is important. They’re still going in the oven to bake *at some point*. This is the lovely part about this process, you can parboil the potatoes any time you wish. I knew that we were going to have a rather frantic evening, so I boiled my potatoes in the morning and let them sit in the fridge all day, ready to be popped into the oven fifteen minutes before dinner. SO easy. But I digress. 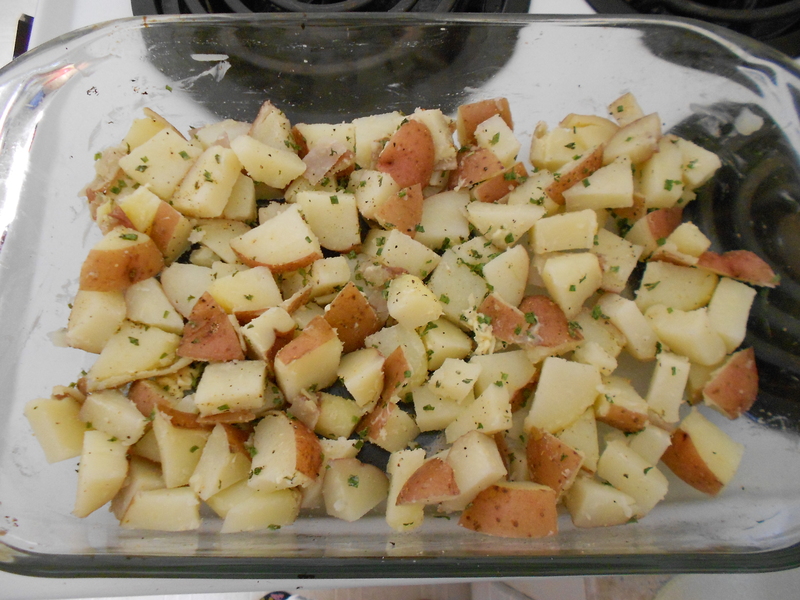 The potatoes are boiling for 5-10 minutes, depending on how big your pieces are. You want them to be slightly fork-tender, but not mushy *At All*. Remove them from the stove and strain them. After they’ve cooled a bit (and most of the wetness on them has evaporated from the heat), you can either put them in the fridge, or if you are going to cook them immediately, dump them into or onto your oven-worthy cooking vessel. Turn on your oven to 375 degrees. Now for the fun part – the seasoning. The whole shibang is going to head into the oven for 15-20 minutes, and half-way through they should be stirred up a bit so they get crispy on all sides. They are definitely house-on-the-prairie-slaved-over-a-cast-iron-skillet-all-day good, without the actual slaving-over-a-cast-iron-skillet part – which is even better.